Pomegranate trees (Punica granatum) are native to the Middle East, and are now grown in warm, relatively dry climates around the globe. Dwarf varieties make it possible to grow pomegranates even in colder climates, bringing them indoors in winter. Pomegranates are experiencing a resurgence in popularity due to the finding that their fruit is rich in antioxidants. 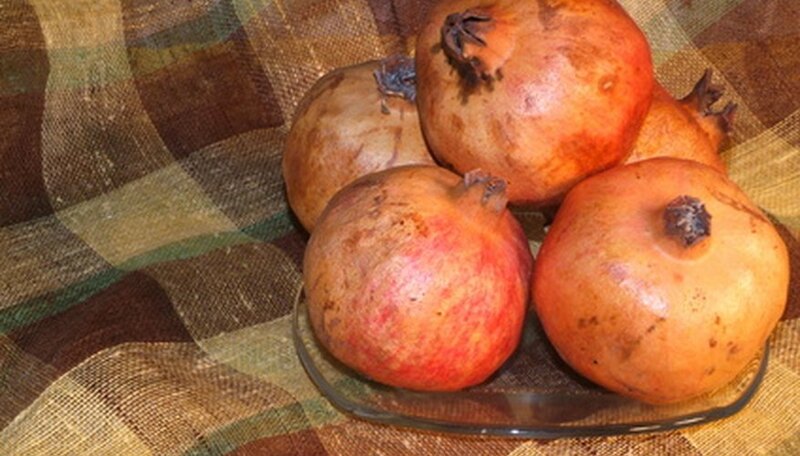 The best pomegranate varieties vary depending on your growing conditions. The 'Sonoran White' pomegranate is an heirloom variety which grows in isolated pockets of the American southwest. The Northern Arizona University Center for Sustainable Environments states that this variety was introduced to the U.S. around 1700. It blooms with brilliant scarlet flowers, and the juice of its seeds runs a pale pink rather than the deep red of most modern varieties. According to the center, the tasty fruit of this heirloom matures slowly, and thus is the best choice to avoid fruit cracking in hot conditions. This is also the most salt-tolerant pomegranate variety, making it the best selection for growing in many desert environments or areas with poor soil. The Clemson University Extension advises that 'Wonderful' is the pomegranate variety against which all others are judged. The most common pomegranate in cultivation in the United States, 'Wonderful' grows 8 to 12 feet tall and bears a profusion of large, deep-red fruits that ripen in September. Its red-orange flowers attract hummingbirds, and its small, glossy leaves make this pomegranate and attractive landscape tree in hardiness zones 8 and 9 in addition to its value in producing fruit. Texas A&M University Extension adds that while 'Wonderful' is the most common commercial pomegranate variety in California, other varieties such as 'Purple Seed' and 'Spanish Ruby' excel in Florida, where more humidity would make 'Wonderful' less productive.